Beautiful design with cut to clear star, grape cluster and floral pattern. This lovely bowl will add a touch of elegance to any décor. THIS IS A BEAUTIFUL CUT GLASS CRYSTAL COBALT BLUE BOWL WITH CLEAR CRYSTAL IN THE ELEGANT DESIGNS THROUGH OUT. THE BOTTOM OF THE BOWL IS CURVED STAYING WITH IN THE TOTAL DESIGN.8 POINT STARS LAY WITH IN THE OUTER SWIRL AND THE LARGE CLEAR WHEAT SWIRL CATCHES YOUR EYE THE BOTTOM. Poland Crystal bowl. This large bowl is 8" wide and 5 1/2" tall. The bowl has a saw toothed rim, vertical lines and stars on the outside. The base has a clear thumb print design. The bottom of the bowl has a star design. The item can be used as a table centerpiece or eyecatcher in any interior. The glass is cut to clear and has a very nice appearance when the light catches it. Local Pickup . Crystal clear glass / blue ( is not 100% crystal but a pretty high lead content so when you tick to it, you also hear the sound crystal makes but that not clear as high lead content crystal sounds). perfect to put your candy in on the table. 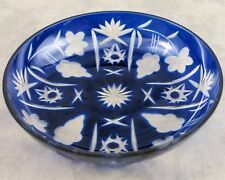 COBALT BLUE CUT TO CLEAR BOWL~HAND CUT USSR-BADASH? COBALT BLUE CUT TO CLEAR BOWL~ FLAWLESS AND GORGEOUS~ 6.5" WIDE AND 3.5" DEEP~ NO MARKINGS BUT BY MY SEARCH I BELIEVE TO BE BADASH CRYSTAL USSR~YOU DECIDE AND. I WILL MAKE EVERY EFFORT TO MAKE IT RIGHT. There is a small mark in the lip and another small scratch. (see last picture). The mark on the lip, I believe was made during the production, it is more of a bubble. The vibrant blue is made up entirely of minerals, no dyes or paints are used. Caesar Czech Bohemian Crystal Glass Handmade Cased Cobalt Blue Bowl from the NEPTUNE COLLECTION. C A E S A R CRYSTAL B O H E M I A E " NEPTUNE " COBALT BLUE CRYSTAL BOWL NEW with ORIGINAL STICKERS and " CAESAR CRYSTAL BOHEMIAE " on bottom of bowl. Classic Pinwheel Design, with a Polished Sawtooth Rim, on a heavy faceted clear pedestal base. Plus A Free Market III Blue Votive Candle - French Floral Market With Gardenia and Honeysuckle Scent. Handmade High Quality Glass. New In Box. 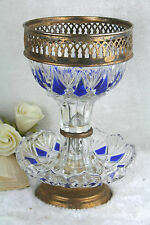 BLEIKRISTALL BOHEMIAN COBALT BLUE CUT TO CLEAR CRYSTAL BOWL WITH LABEL 4.25"
Has a small sticker of the maker. Wedgwood bowl. From the Vera Wang collection in their Illusion pattern, marked on the base with their hallmark. Charlie's China is not responsible for such wear or manufacturer's imperfections. we consider pot stones, crazing, and kiln spots as such.